When it comes to protecting the environment, storytelling is one of the greatest methods of striking the emotion in individuals needed to get them to make a difference. Sparking an emotion in the audience is one characteristic of storytelling that can be much more effective in convincing people to take action (Robin, 2013). As Katie Harrison (2014) pointed out in a blog post on “Digital Storytelling,” a narrative story telling a message you want to portray can be much more effective than posting a sign.” Adding images to that narrative can be even more powerful. Take, as an example, this television commercial about littering. Filmed as part of the “Keep America Beautiful” campaign in 1971, the advertisement was designed to get people to be more responsible for protecting the environment at the individual level, attempting to elicit action by individuals. Regardless of the symbolism of the “red man” having fast food garbage thrown at his feet by the “white man” and the obvious absence of the responsibility that industry and manufacturing companies had on large-scale pollution offenses, the ad campaign was very successful. 100,000 people were motivated in four months time to request information about reducing pollution. The campaign is attributed with getting people to reduce litter by as much as 88% in 300 communities in 38 states by 1983 (Ad Council, 2004, p. 7-8). Bringing things forward to the 21st century, according to “About Our Community” information at The Story of Stuff project, “Five years and 40 million views later, we’re a Community of 500,000 changemakers worldwide, working to build a more healthy and just planet” (“Story of Stuff,” n.d.). The project uses a video narrator overlaying animated illustrations to tell the story of how the products we purchase all have an impact on our environment and how the results might not always be obvious. The following is a short animated video encourages using eco-friendly Ganesh idols instead of non-biodegradable products that fill the rivers with products during a popular Ganesh Chaturhi festival in India where 100’s of thousands of idols are immersed in the rivers as a means of asking for a blessing of wealth and prosperity. As new modalities are developed, new opportunities are made available for engaging a new generation. Probably one of the more popular area for citizen engagement comes from online games for kids and incorporation of storytelling methods in class curriculum. “Storytelling appeals to children’s imaginations and emotions and helps make learning more meaningful. When children listen to stories, they create mental images that belong to them, connecting the content to something personally significant” (Goral & Gnadinger, 2006, p. 4). PBSkids has a interactive game called eekoworld where you can create your own EekoCreature which lives in an environment that you choose. While your creature is moving around it may encounter choices about what happens is its world. There is an interactive game that has you look around a typical house to determine if there are things you can change to conserve resources like turning off the water or containing an oil spill in the garage. There are several other modules related to recycling, plants and animals and the future. Lesson plans for teacher are available, as well as activities that parents can do with their children as family. Community-based projects are included to cultivate stewardship of the land. Frank Rose (2011) says, “…if stories themselves are universal, the way we tell them changes with the technology at hand. Every new medium has given rise to a new form of narrative” (p.1). A good example of this comes from a recent USC Anneberg Innovation Lab event called CRUNCH Hackaton: Transmedia Brading for Environmental Awareness. Teams of students came together to create “media experiences” to be used as transmedia storytelling to get the public more involved in environmental issues like air quality or access to parks. The winning project “…was a game for children, in which players build their own communities and raise their environmental awareness by planting, watering and fertilizing plants virtually” (Wang, 2013). Using storytelling methods to involve the public in environmental education, whether from the corporate world or from a non-profit organization, has been recognized as a communication method that “…established a common ground among all participates and provides a faster method of establishing a social relationship” of which, hopefully, excites people to take action (Barker & Gower, 2010, p. 302). I expect that we’ll be seeing storytelling continued to be used as a means of getting a message across to an audience as we, as humans, respond to that kind of personalization. Basu, S. (2010, September 3). 10 environment games that teach kids about earth, ecology & conservation. Makeuseof.com. Retrieved from http://www.makeuseof.com. Primary Mathematics Classroom, 11(1), 4-8. Harrison, K. (2014, February 5). Digital storytelling. katieharrison.org. Retrieved from http://katieharrison.org. Pitrelli, N. (2011). Science journalism and digital storytelling. JCOM: Journal Of Science Communication, 10(4), 1-2. Public service advertising that changed a nation. (2004, September). The Advertising Council. Robin, B. (2013). About digital storytelling: The 7 elements of digital storytelling. Digitalstorytelling.coe.uh.edu. Retrieved from http://digitalstorytelling.coe.uh.edu. Rose, F. (2011, November 3). The art of immersion: Why do we tell stories? Wired.com. Retrieved from http://www.wired.com. Wang, J. (2013, September 29). USC students compete in environmental hackathon. dailytrojan.com. Retrieved from dailytrojan.com. Heidi- your reflection of the value of storytelling in the environmental movement is spot on. Recently, activists in my community have encouraged residents to share stories in order to aide opposition to the proposed Susitna-Watana dam. They understand that a personal narrative can pack more of a punch than facts and figures. This also reminds me of the stories that Patagonia tells in each catalog to promote environmental awareness. I found each of the resources you included on your blog post quite effective- in particular “The Story of Bottled Water”. It’s interesting that the narrator tells the story of the soda execs developing the story of bottled water; we all use stories to promote our ideas. I also appreciate the number of resources you curated and how you organized them on Pearltrees. Maybe you should include a link to your curation on your blog, instead of just on Google+…? I found several resources and examples from the corporate world on sustainability, recycling, and other environmental issues, which says to me that telling stories to sell yourself is effective or big business wouldn’t be doing it! Ooopsies, just saw your link to Pearltrees at the top of the page. Please disregard my comment about the link! I like the approach you took here – it seems like a lot of us came at this assignment thinking about what’s “bad” in our culture’s stories. We had posts about violence, gender inequality, racial inequality, social justice, etc. but you wrote about how storytelling can (oh god) change the world in good ways. I especially like your inclusion of the Ganesha idols video – it’s a double meaning on the word “cultural” you’re using, as if there is now a global culture that can (and needs to) scrutinize cultural practices from around the world that are environmentally destructive. Whether that’s right or not is up for grabs, I guess. 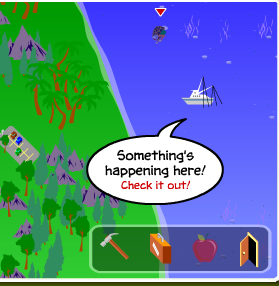 Eekoworld is interesting because, well, our culture is sort of obsessed with disaster and you’d think there’d be more educational games about environmental issues out there to teach kids the kinds of planet-wide thinking they can’t get on their own. Spore and EcoTycoon come to mind but both of those are probably too complex for young kids.Unfortunately, a pro-environmental message is pretty uncommon in our culture’s stories, especially the ones with big budgets behind them. If I was going to offer any suggestions it would be that your conclusion seems abrupt – you just sort of end it and I’m left looking for closure as a reader. A summary, or a few concluding arguments or ideas, or maybe suggestions for further research, would be nice. Thanks for the comment, Nick – good point about the conclusion. I’ll definitely rework that part. I thought about your statement that pro-environmental messages are uncommon in big budget stories. I think perhaps the message is there it just isn’t obvious. For example, in the video you used as example for your “What is digital storytelling” post, Fallout 3 Megaton Nuke…we saw the destruction of the world. That may be seen as a subtle message about cause and effect. At least that was a feeling that I got when I watched it! “What have i just done and who are the innocents whom I have just harmed!” That might be a really naive view of the game, having only see a couple of minutes of it. Because of your interest in video games, I did a quick search on video games and the pro-environment message and I came up with a few hits. As I was looking through them though, I had flashbacks to gifts given me by my great aunt. “Oh look, its a record, Heidi likes music. Let’s get her this Tom Jones album” Or, “she needs a camera for yearbook, we’ll get her this Polaroid because it is so easy.” While the gift may be fun, it isn’t what is popular or being played by your friends. I did find this report, which I’ll have to explore more fully. http://www.bbc.com/future/story/20130826-can-video-games-be-good-for-you. I too enjoyed your topic of environmentalism in digital storytelling. Storytelling is the original and most effective way of getting a message across. Though I am admittedly skeptical of it’s impact on environmental behavior and your blog is working to convince me otherwise. The facts you share combined with the stories is what makes for a convincing argument. I had thought of this kind of environmental storytelling as preaching to the choir so to speak. An example is the Banff Film Festival earlier this month and many of these action-packed, adventure films have an obvious message about protecting the environment. I leave these film festivals inspired with ideas on how I can make a difference but I’m not sure how much my behavior changes as a result. The game example at the end intrigues me. I know there are applications where you can measure you carbon footprint and enter modified behaviors to try to reduce the number. This kind of gamification combined with storytelling I imagine would be even more effective as well. I appreciate the variety of storytelling methods you shared and your Pearltree content curation. Overall your post was very effective and I found myself thinking more about environmental campaigns and do not have feedback for improvement. A way to continue exploring the topic would be to look at how different digital storytelling methods are used for the same campaign: PSAs, posters, commercials, etc. Your ideas were presented clearly and I understood your argument well. You used examples to illustrate the points in your argument effectively. I would agree with Nicholas that there needs to be a kind of conclusion for your post, and it was neat to see a more positive approach to how depictions of environmentalism can influence a future generation. It was weird to see the Indian commercial after all these years, too. I kept thinking that I never met a Native who looked like that. This had me thinking of the historical situation and how stories to spark action must change with the times. This is exciting to me because it opens up opportunities for us to write. I heard one the other day in a friend’s car, too, but could not find it. These songs are still being played on the radio against environmentalism, against scientists, pro big trucks and etc. It sounds like a stereotype of conservative values in song form, but people are latching onto these stories and they are dear to a particular community. Therefore, I was wondering if you can imagine a story that could break these identifications with being anti-environmental? It is like a kind of currency or street cred in certain communities to be skeptical against science, and especially environmental science. How to convince people the importance of scientific issues without making it a left/right conservative/liberal issue? I see this as having real world consequences. Although it does not seem to relate to your post directly, I still thought it was a cool thing your post made me remember. I had almost forgotten about this, so thanks! One last note: it would be cool if you linked to KH’s blog. I love how you quoted her above, and may copy you, or is it be inspired by you, and start citing and linking to other blogs as well! In conclusion: your post really got me thinking. Thanks! I should also mention, that I enjoyed clicking through your Pearl Tree. I know in other posts you asked about embedding the Pearl Tree directly, and I think this would visually strengthen your post: although it looks great with out it. I wanted to add, also, that I grew up in Colorado and there was a very strong environmental movement there in the ’80s. There is one story that has stuck with me still, (I cannot find it. It involved the last tree in a distopian future), so I can say, from first hand, stories like these do work. Great post.